These Gothic Gauntlets are a product of German design, possessing a style that pairs them nicely with the gothic armor that the Holy Roman Empire was known for. And not only are they impressively decorative, but they are also extremely functional. Gothic armor, including these gauntlets, draw much of their inspiration from gothic design and architecture, using lines and curves to create an armor base that is much more sturdy then just raw plates of steel. These gauntlets consist of metal plates, layered over a glove base, which makes wearing the gauntlets easy and comfortable. The layering of plates also ensures that the gauntlets are articulated, which helps them to move freely and easily. Even the fingers are layered with articulated plating, while the majority of the gauntlet also features fluting, in the form of little raised lines that make the steel resistant to bending and impacts. 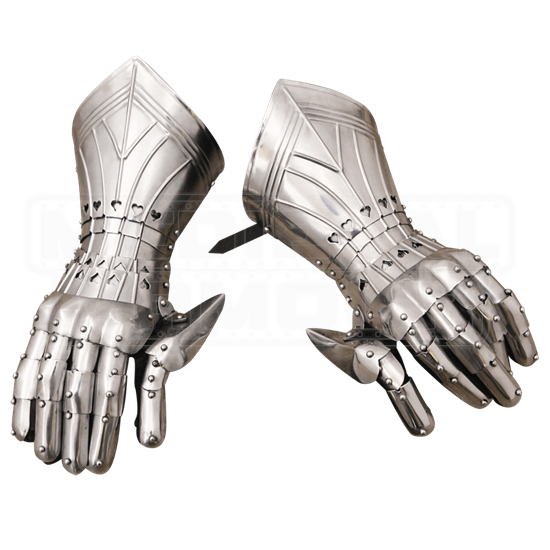 These gauntlets are available in only one size and are sold as a matched pair. They also feature a leather strap and buckle, for securing the gauntlets to the arm tightly and securely. For keeping your hands fully protected, there is no better piece of armor to wear then a good pair of gauntlets, and these Gothic Gauntlets are just the way to ensure that your hands are not just safe, but they are safe and fully functional.